Electrical, Wiring, and In Car Entertainment Electrical, Wiring and In Car Entertainment questions belong here. Hi, my searching didnt come up with anything. can someone please tell me which harness upfront has the reverse light and what color are the wires? For a Backup camera installation. Last edited by alex_nyc; 01-20-2014 at 04:28 PM. What's the goal here? Backup camera or something? The underdash fusebox is the junction point for many harnesses. Auto and CVT trans car has a REV relay behind the glovebox, that would be easy access. Ok, the relay in the glovebox should be pretty convenient. Flop the glovebox wide open as if changing cabin filters, you should find a row of relays at the bottom edge. My pic shows it to be the black relay on the drivers side of the row. Green wire is + output to the reverse lights. I got a $16 camera off the internet for my backup cam, it's connected to the iMID in the dash. Mine came with the cable for the camera, it has RCA ends and it had a 3rd wire hanging outside of the RCA jack on each end. 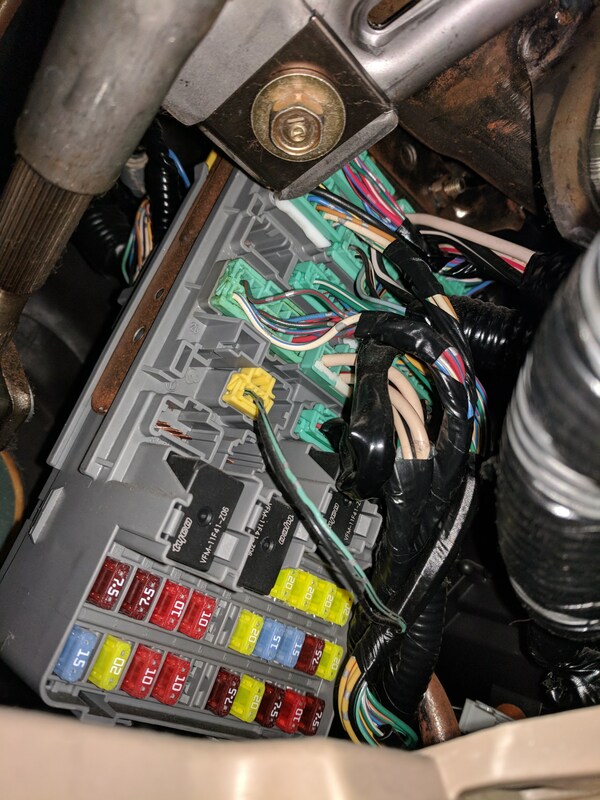 The 3rd wire was supposed to be used to connect to the backup light circuit in the trunk area. im not sure what iMID is yet, but I have a $24 wireless camera kit plus a $17 video screen. The rear wiring is already done. Hopefully the weather will be warmer tomorrow so I can finish this one & start the next camera in my wifes 2010 civic LX auto 4dr no nav. Do you have the wiring info my 2010? iMID is the information display screen/monitor in the dash of 12 and never Civic. 2010 civic LX auto 4dr no nav. That's gonna be trickier. Only connector up front is in the fusebox, and only one wire unless you happen to have something plugged into the accessory connector hole (open spot w/6 pins or so at top left of fuse portion when the box is standing upright). Layout is numbered 1-22 across the top, 23-42 across the bottom. #1 is yellow, start counting from that.... #22 and 42 are both empty. Pic is of the dash fusebox laying on its side. Fuses are at the bottom when in the car. Connector E is a long one with a gray cover, the middle of the 3 long ones. Ill give it a try with my test light otherwise I might have to run a long wire from the backup light harness. Last edited by alex_nyc; 01-20-2014 at 11:21 AM. Some FYI info to share. I took this pic of the wires, harness & relays from behind the glove box. The green wire to the bottom left is the reverse wire, it has power only when the key is on -while in reverse. You can do this with the engine off. There were 2 green wires so get your test light ready. The black relay on the bottom right in the reverse light relay. so get your test light ready. Test light? That's like a 4 letter word! That's not allowed 'round here! Seems like there's only about 3 people that even know what one of those is AND knows how to use it. How do I figure out which connectors are D and P? Here's a photo of my under dash fuse box. 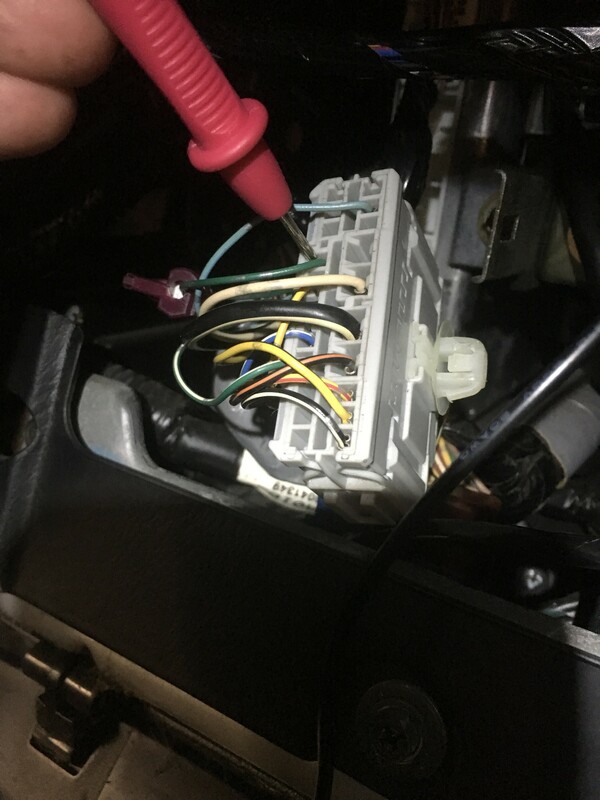 I'm trying to connect the reverse signal wire on my head unit to the reverse wire coming out of the fuse box. Thanks! Last edited by Scottboyd02; 04-15-2018 at 07:50 PM. Where is connector D or P like described above? Also....you could just run a wire from the back of the car, lay it along with the camera wiring. Feel like an idiot saw post 12 right after I posted. I do have a manual. 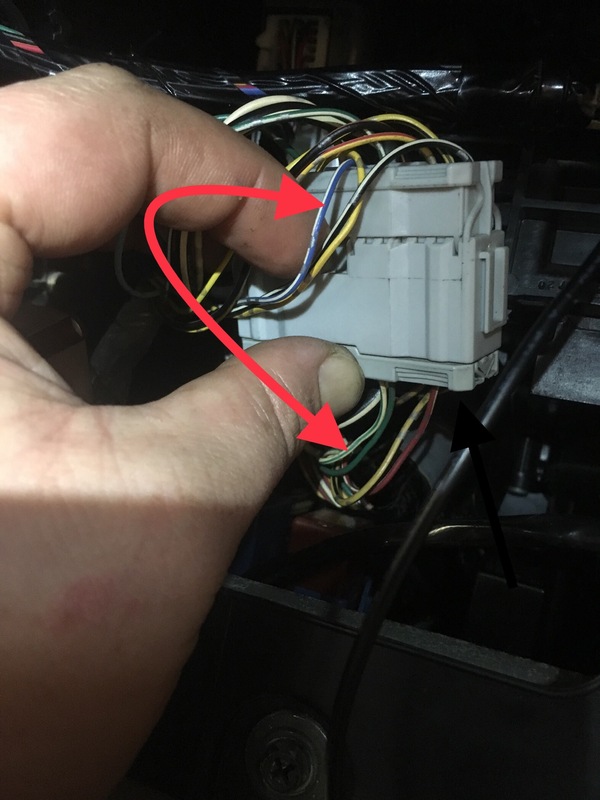 (05 EX Coupe) Reverse lead by relay didn’t jump out at me, is it a large gauge wire or hidden under something? I’ve already wrapped my power, ground and video cable together with electrical tape. So that’s why I want to pick up the reverse signal by the dash. I assume the terminals are numbered on the connectors right? No. I ALWAYS use a wiring diagram and check wire colors.....even when a connector is labeled....because they don't always follow the rules. Also.....I mentioned IIRC (If I recall correctly) about the relay....and I finally got to look at a real diagram.....the auto trans cars use the reverse relay, not manual tans. I CRS. Sorry bout that. Appreciate the help. The green/green-white wire that passes through that big gray harness junction in front of the ECU will be easy to tap! Still have those diagrams out? Since I’m right there which one is the VSS (vehicle speed sensor) I read that it was right there behind the glove box a blue white wire. It come out of that gray junction as well? Powering the camera with the accessory wire so it’s only on when the car is on. Modern head units are designed to function this way. So yes I can switch to the reverse camera while driving Same way I have my Avalanche hooked up. Running Pioneer NEX head units. I pulled that big gray junction connector out too look at it and the blue/white turns into white/green! So that should be the VSS! While I had it out I noticed that there’s is a green/white wire that turns into a green wire on the bottom. Like mentioned above. However there’s also a green wire that turns green/white on the bottom. Time to bust out the multimeter to find out which is which. OK so it’s the green wire the turns into a green/white wire on the bottom. To clarify the green wire comes in through the top of the big gray junction connector and comes out the bottom a green/white wire. It’s further back on the connector towards the firewall. Um, you're posting in 2 different threads? "edible Green" Civic Wiring harness ?